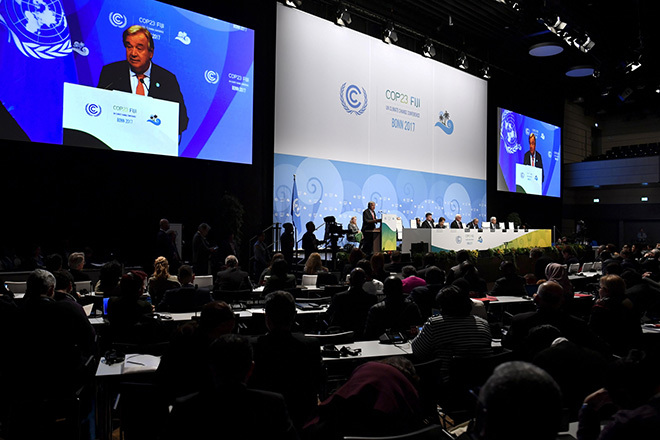 BONN, Germany: Almost 200 nations kept a 2015 global agreement to tackle climate change on track on Saturday after marathon talks overshadowed by US President Donald Trump’s decision to pull out. Delegates agreed to launch a process in 2018 to start reviewing existing plans to limit greenhouse gas emissions as part of a long-term effort to ratchet up ambition. It would be called the ‘Talanoa Dialogue’, after a Fijian word for story-telling and sharing experiences. And they made progress to draft a detailed rule book for the 2015 Paris agreement, which seeks to end the fossil fuel era this century, at the meeting in Bonn that ran overnight beyond a planned ending on Friday. The rule book, covering aspects such as how to report and monitor each nation’s greenhouse gas emissions, is due to be ready by December next year. Many delegates said the work needed to go faster. “Right now we’re moving at a brisk walk, so all countries will need to really pick up the pace from here,” said Jose Sarney Filho, Brazil’s minister for the environment. Gebru Jember Endalew of Ethiopia, who leads the group of least developed countries, also said “many areas of work are still lagging behind”, despite steps forward in Bonn. The Paris pact aims to limit a rise in average world temperatures to “well below” two degrees Celsius above pre-industrial times, ideally 1.5 degrees Celsius to limit more droughts, floods, heatwaves and rising sea levels. But existing policies are on track to cause a rise of about three degrees Celsius by 2100. The Talanoa Dialogue would be a step towards tighter policies. The Bonn meeting was under the shadow of Trump’s decision in June to withdraw from the Paris accord and instead promote the coal and oil industry. Trump doubts that man-made emissions are the prime cause of rising temperatures. No other nations have followed suit and even nations whose economies depend on fossil fuels have rallied around. are moving forward,” United Arab Emirates Climate Minister Thani Ahmed Al Zeyoudi told Reuters. One senior European diplomat said Trump’s decision had “sedated” the talks into a numbed sense of unity, avoiding major confrontations to underscore that the main faultline on policy was between Trump and the rest of the world.